Now the dust has settled, I think it's fair to say that the tournament was a success both for the quality of squash on offer, the attendance, and the hospitality and convivial atmosphere, so big thanks to tournament organiser Alan Thatcher for all his time and effort in ensuring we hosted a successful event. Club captain Dean Newberry and chairman Mark Groves GIdney should also get a pat on the back for all their efforts and support. Thanks must also go to member Artyom Liss for his excellent photos.
" What a success! Three days of compelling squash, topped off by a fine Ladies Exhibition Match for the Collins Jewel, and then five tight and exciting games of great quality for the Men’s title. The events were well attended, especially as the rounds progressed, and the feedback from both the players and the spectators has been very positive. We are perceived as having put on a good show: a welcoming club, good food for players and spectators, and a well run tournament. Those who did all the work have been recognised elsewhere, but we would also like to thank the sponsors in general, but specifically those who are directly linked to supporting this tournament.....Select Gaming, Collins, The Spa Hotel and JVIP for their grandstand seating, and all those members who kindly provided raffle prizes; with their tournament-specific contributions the club pretty much broke even on hosting the event. 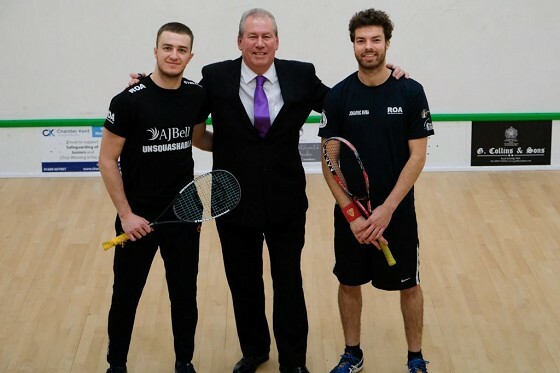 We are of course aware that this tournament took over a lot of squash courts from the members over the course of the three days, but it showcased the club in a very favourable light and hopefully will gain us some new members, and more importantly provided everyone who came some splendid top quality squash to admire." Thank you for making me feel very welcome last Saturday. It was a pleasure to meet the people who make the TWSRC run smoothly and provide a venue for championship squash. I look forward to our future discussions and to seeing how your plans for increasing young players into the game develop.